The Pittsburgh MotoAmerica round got off to a somber start last weekend when racers and teams learned that Brian Drebber, the popular series announcer, was killed while riding from his home in Georgia to the airport. Brian was on the way to Pittsburgh to call the races when he collided with a deer. Drebber was certainly not the first very experienced rider to be taken out by a deer strike. Larry Grodsky, who wrote the "Stayin’ Safe" column in Rider magazine for decades, also died after a collision with a deer in Texas. I lived in Alberta and worked in Canada’s Rocky Mountain national parks for a few years, amidst one of the world’s most abundant and diverse deer populations. So I know from experience that some deer collisions are practically impossible to avoid. But, as we’re about to enter the highest-risk season for deer strikes, now’s a good time to review best practices. There are five main American deer species. In the order you’re likely to see them on roadsides, whitetail deer predominate, followed by mule deer, elk and moose; unless you’re riding in very remote terrain, you won’t encounter caribou. Whitetail deer, once nearly wiped out, are now the most common animal threat for motorcyclists. They'd be cute if only they'd stay in the woods. Photo by Lance Oliver. Around 100 years ago, whitetails were hunted to near extinction, but the advent of modern wildlife management practices, the near eradication of predators like wolves and mountain lions and, more recently, a decrease in sport and subsistence hunting, all conspired to create a deer population boom in the 20th century. About 30 million deer now live in the United States — almost as many as there were before the arrival of European settlers. That’s a lot of deer, and they adapt remarkably well to living in close proximity to people. As anyone with a vegetable garden knows, you’re now as likely to encounter deer in the suburbs as you are when riding in the country. 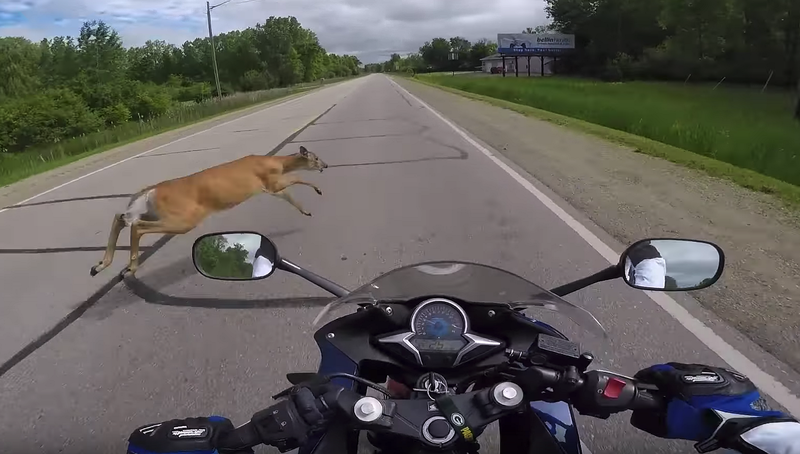 The unlucky guy in the video below found out not only that you don't have to be in the country to hit a deer, but also that it can happen in your first minute of having a motorcycle license. According to the Insurance Institute for Highway Safety, the five states with the highest risk of deer strikes are West Virginia, Montana, Pennsylvania, Iowa, and South Dakota. As that list suggests, there’s not any particular region of the country where you’re safe. According to State Farm, one out of every 41 West Virginia customers filed a deer strike claim in 2016! Unfortunately and unsurprisingly, motorcycle riders are far more likely to be injured in a deer strike than are car drivers. I’ve seen data gathered by the Michigan DOT that suggests about three quarters of motorcycle-deer collisions result in injury to the rider and/or passenger. When they studied deer strikes in 2009, all nine fatalities in Michigan were motorcyclists. According to the AAA, motorcycles — which account for less than one percent of vehicle miles traveled — account for 70 percent of deer-strike fatalities. Ouch. So, what can you do to reduce the chance that you’ll become such as statistic? You know who is rarely surprised by deer on the roads? Hunters, because they know where deer can be expected, and watch for them. If you’re going to ride in deer country — which basically means, if you’re going to ride anywhere that’s actually fun — you should learn to think like a hunter. I’m not kidding. Like Field & Stream on Facebook and read their deer hunting tips. Even better, take a hunter education course and start hunting (as they say, If you’re not part of the solution, you’re part of the problem). Common Tread contributor Teri Conrad's Kawasaki Drifter lost half its distinctive front fender when she hit a deer, but because she was able to keep the motorcycle upright, she was able to continue the ride and was uninjured. A whitetail deer usually doesn't weigh more than 150 pounds, so riders are most often killed or seriously hurt because they crash, not because of the initial impact with the animal. Photo by Teri Conrad. Deer populations peak in the spring, but the risk of hitting them on the road peaks in October, November, and December, during the annual rut. Deer are on the move at this time of year. It’s also the time of year when mature adults weigh the most, making collisions that much worse. Although you can encounter deer at any time of the day or night, they are most active between dusk and midnight, then again at first light. They typically spend the middle of the day in deep cover, but most deer are not really forest dwellers. Learn to identify edge habitat; prime food sources such as standing corn, mast crops like acorns, and orchards; and travel corridors like treelines, hedgerows, and gullies. Are you riding through prime habitat? Are you crossing a small gully (especially one channeled into a culvert)? Are you passing between a food supply and cover at dawn or dusk? Slow down and pay extra attention. Deer are herd animals. If you see one crossing the road in front of you, be alert to others that might be following (as the video below shows). If you see deer on both sides of the road, there’s an excellent chance that as you approach, the herd will coalesce. This is especially true if there’s one individual on one side and several on the other side; the solo animal will want to get into the safety of the herd when alarmed. Deer are fleet animals that run from a perceived threat. Unfortunately, they evolved a flight response for wolves, not motorcycles. As a consequence, they tend to zig-zag and change direction after an initial startled leap. What this means to you is, if you see one crossing the road in front of you, don’t assume you can just adjust your line to pass behind it. If you scare it, it may well reverse course and cross your path again. Always cover the front brake. Practice emergency stops. Attend a track day. Get expert training. When you spot a deer ahead, your front brake is a lifesaver, but only if you’re ready, willing, and able to use it right. Play “What if?” with yourself. When you come across good deer habitat, ask yourself, “What would I do if Bambi jumped out from behind that bush?” Mentally rehearse applying the brakes and aiming for a gap with aggressive counter-steering, not target-fixating on the deer. I’ve actually heard people claim they increase speed, with the idea that spending less time near the deer limits the opportunity to hit it. This is not just nuts, it’s super-nuts. When you take your hunter education course they’ll teach you that a bullet’s kinetic energy and destructive force is a function of mass times velocity squared. In a worst-case scenario, you are way better off scrubbing as much speed as possible and hitting the beast at a slower speed. First, the obvious: Don’t ignore deer crossing signs, especially at peak times! Pay attention to roadkill; deer travel along the same paths and tend to be hit in the same places over and over. Wear a helmet and the best protective gear you can afford, or at least better than the shorts the guy in this video is wearing. If you’re out riding in the country, you should already be watching for traffic, cross traffic, blind driveways, cops... all that goes without saying. But a lot of riders choose a speed based on those human factors and then basically play Russian roulette as far as animals are concerned. Anywhere that you could encounter deer you should also scan and assess the verges of the road. How close is the treeline? When was the right-of-way last mowed? If the grass in the ditch is waist high, you won’t see deer until they step right onto the shoulder. Processing that additional visual information means slowing down for safety. If you’re riding in a group, increase your following distance and maintain a staggered formation in order to give each rider time and space to brake and take evasive action. If you see deer ahead, slow down and do something (for example, raise an arm or stick out a leg, or flash your brake light) to ensure following riders notice, too. If you pass deer near the road, consider flashing your high beam or honking to warn oncoming drivers and riders. I like to cheat my lane position as close to the centerline as possible, on the theory that deer enter the road from the sides, and because I want the ability to choose an escape path to either side. Don’t over-ride your headlights! Seriously. Your motorcycle’s headlights are probably not as good as the average car’s. Next time you’re riding on an unfamiliar country road at night, try stopping before you get to the next mailbox. You’ll probably find that exercise to be a challenge, even at the posted speed limit (which seems frustratingly slow in daylight.) If you frequently ride in primo deer country, you should equip your bike with extra lights. And do not get caught out after dark with a dark face shield. Insurance industry research has largely discredited "deer whistles." Some people advocate flashing your lights and/or honking your horn if a deer seems transfixed by your headlights. Trying those things is probably beyond the capability of most people in a panic-stop situation. If you get your speed down to 15 miles an hour and you still have 50 to 100 feet to work with, feel free to flash your lights and honk, and let me know if it seems to work. If you think deer are bad, may you never meet a moose on the road. Photo by USAF Staff Sgt Joshua Strang. In high-risk conditions, I like to tuck in behind another vehicle whenever possible. Yes, it’s a "deer-catcher," but the biggest advantage to following a car is you get to look way ahead into the area illuminated by that vehicle’s headlights. Don’t tailgate so close that if the driver sees a deer and hits the brakes, you’ll rear-end him. But do pick a distance such that if he scares a deer off the road, it won’t have time to get back in your way. In poor light, deer are remarkably well camouflaged. Your best hope of seeing them is catching the light reflected from their eyes. There are lots of little reflectors out on country roads, marking gates and such, but those reflectors don’t blink when caught in your headlight! Any time distant headlights or taillights seem to flicker, it could be because your line of sight was momentarily blocked by a deer. If you see brake lights come on way up the road for no apparent reason, take it easy as you approach that spot. Even if you do everything right, deer strikes remain probably the hardest crashes to avoid. When I pitched this story to Lance, he gave me two sobering examples. Lance took the Stayin' Safe rider training course when Larry Grodsky taught it and described Larry as the most aware, alert motorcyclist he'd ever ridden with. Long before his death, Larry told his fiancee that the one thing that might take him out some day was a deer, and sadly she told that story at his funeral. The other example Lance told me about was a guy he knows who was taken out by a deer that leaped from an embankment above the road, landing on the rider's helmet. The rider survived, but he had no chance of seeing that deer until it literally fell on top of him. In a situation like that, all you can do is hope your safety gear will save your life.